Despite the imposition of tariffs on Chinese solar panels by the US Department of Commerce, sales of solar PV panels is set to increase by one-fold over the next 5 years. AEI Consulting recon that, over the next five years, materials used in solar PV modules will surge to nearly US$42 billion worth of sales. This is a very encouraging finding from the perspective of solar PV entrepreneurs, as well as us who think green is the way forward. If the people still think that solar photovoltaic business is not profitable, this piece of information would and should be an eye opener. 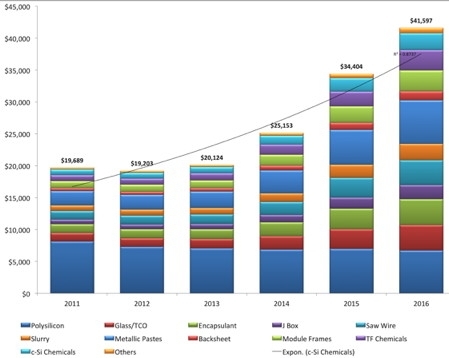 However, in 4 years' time the use of poly-silicon would shrink to 16% as a result of adopting new means of reducing its use, and due to improved processing methods. Increasing cell efficiency also will lead to more technology improvements, which would effectively reduce the solar module prices. Manufacturers of thin-film solar PV modules are progressing fast in improving efficiencies and reducing materials costs. Technology upgrades include improved plasma deposition, buffer layer designs, and anti-reflective layers, and laser patterning. Also, advancements are seen with nano-crystalline silicon oxide doped layers, replacing the cadmium sulfide (Cds) buffer layer with a more transparent material (zinc oxide or ZnO), and adopting close spaced sublimation (CSS) deposition for CdTe cells. Cost to put solar PV panels on your rooftop will obviously be cheaper. Cheap in this context is relative but judging from the world-wide investments and green initiatives by a lot of countries, you can be sure of better acceptance of this method of RE in the near term. Currently, a grid-connected installation would cost you roughly RM14,000 to RM15,000 per kWp of solar PV. In 5 years, that could go down well below RM10,000 (US$3,000). Throw in the FiT incentive and you just need to pay a fraction of that upon signing of the power purchase agreement.